A project to repaint I-65's Kennedy Bridge over The Ohio River at Louisville has been marked by scandal. This page contains a collection of news items about the bridge repainting scandal. Work was to begin in late August to repaint the Kennedy Bridge. The project is expected to last until August 2006. That state has awarded a contract to paint the Kennedy Bridge. The winning contract was awarded to Atlantic Painting Co. of Oak Lawn, Ill. That company submitted the low bid at $17,777,777. Work is planned to begin by August, and the deadline for project completion is July 31, 2006. This project will be the largest project ever undertaken by Atlantic Painting. Painting of the bridge was suspended in 2001 after contractors disclosed a state bridge inspector had been asking for bribes. If all goes as planned, by the end of 2005 I-65’s Kennedy Bridge over the Ohio River will be completely repainted for the first time since 1977. Originally the bridge was to be repainted in 1993; however, inspectors found cracks that needed to be repaired before continuing. In 1999, workers began repainting the bridge. The job ended two years later when contractors walked off the job claiming that state inspectors had solicited bribes. One inspector pleaded guilty to federal charges and is serving a six-year jail term. The Kentucky Transportation Cabinet reached a sealed settlement with Ron Gardner, a KYTC employee who alerted officials that inspectors were extorting bribes from contractors. A judge opened the settlement in January at the request of the Courier-Journal. It was revealed that the KYTC paid Gardner $480,000 to settle the lawsuit. A new Inspector General has been named for the Kentucky Transportation Cabinet. The new inspector, Robert Russell, will have the ability to report either to the Transportation Cabinet Secretary or directly to the Governor. Over the last 18-months several cases of corruption have been reported in the transportation cabinet, including the scandal surrounding the repainting of the Kennedy Bridge in Louisville. The sentencing for Kevin Lee Earles has been rescheduled for Sept. 27 to allow his lawyers more to prepare arguments against extra prison time sought by the government. Earles, a 23 year veteran of the Kentucky Transportation Cabinet, plead guilty to soliciting bribes from contractor that was repainting the Kennedy Bridge in downtown Louisville. Lawyers for the government are seeking added prison time because it has been revealed that Earles threatened to kill his victims. In conversations secretly recorded by the FBI, Earles told a foreman that he would kill the foreman is the foreman turned him in. 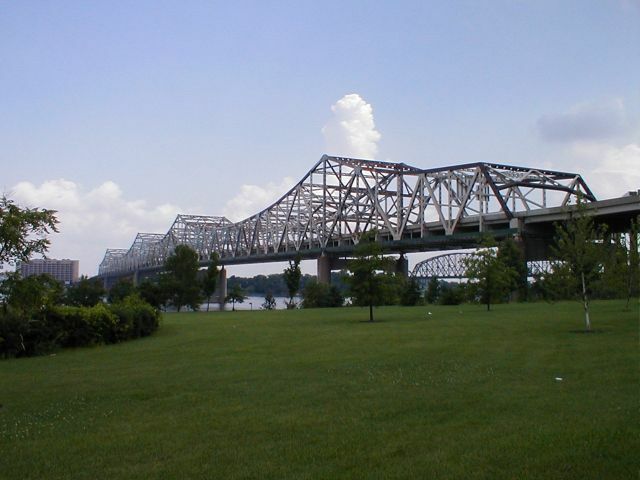 Earles threatened to ruin the business of the contractor and claimed to have previously used his tactics against a contractor repainting a bridge in Owensboro. A report commissioned by the FBI finds that the $14 million project to repaint the Kennedy Bridge over the Ohio River at Louisville was doomed from the start. The study reports that officials disregarded concerns that the project would wash old lead based paint into the Ohio River. The method of painting was also attacked: the state planned to "overcoat" the existing paint. The study predicted that this method would fail because the existing paint is unstable and would peel off. Work on painting the bridge was suspended in 2001 due to FBI inquiries alleged bribery and other flaws in oversight. Kevin L. Earles, a 23-year veteran employee of the Kentucky Transportation Cabinet, pleaded guilty on March 28 to federal anti-corruption charges. He was accused of soliciting bribes during an inspection of the Kennedy Bridge over the Ohio River at Louisville. The Kennedy Bridge carries I-65 into Southern Indiana. This Courier-Journal article reports that Transportation Secretary James Codell has called for am "internal process audit" to determine what the transport cabinet has done wrong after recent scandals involving bridge inspections, fraud in a minority business program, and problems in the driver's licenses office. According to this Courier-Journal article a federal grand jury in Louisville indicted Kevin Lee Earles, 41, on three counts of extortion for allegedly demanding bribes that totaled $18,000. Earles was a KYTC inspector for painting work being done on the Kennedy Bridge in Louisville. He reportedly told a painting-company executive that there was a ''history'' of making payments to inspectors. The Lexington Herald-Leader reports in this article that a second lawsuit has been filed over alleged illegal activity regarding inspection of the Kennedy Bridge. In this lawsuit, a KYTC employee claims he was demoted after reporting that state inspectors were falsifying records, getting kickbacks from a supplier and soliciting bribes from contractors. The Courier-Journal reports in this Oct. 25, 2001 article that a lawsuit has been filed claiming that KYTC officials and bridge inspectors solicited bribes regarding repainting work on the Kennedy Bridge over the Ohio River in Louisville.